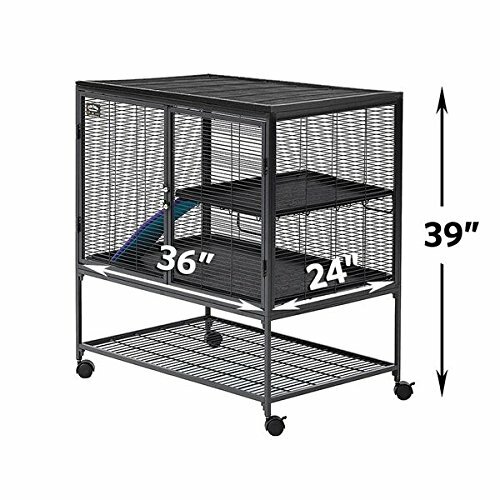 The Critter Nation Single Unit (model 161) small animal cage by MidWest Homes for Pets provides the ultimate habitat for a variety of small animals including Rats, Chinchillas, Ferrets, Dagus and Cats. The single unit Critter Nation creates the spacious living area your pets require to thrive and the 1/2 " horizontal wire spacing allows pets to fulfill their instinct to climb & explore in a secure environment. 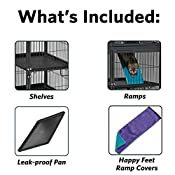 Each single unit Critter Nation / small animal cage comes equipped with 1 ramp and ramp cover, one resting shelf and one easy to remove base pan for easy cleaning. We included full-width double doors that provide maximum accessibility for easy cleaning and feeding. The wide expansive shelf and full-width plastic pan floor provide a generous play area for your Dagu / Ferret / Chinchilla / Rat and helps to prevent dangerous falls. Designed with customer convenience in mind, we've included "critter-proof" dual-locking door latches that provide a secure, easy one-handed operation. The shelf includes a removable plastic tray for easy cleaning and is height adjustable so you can tailor the small animal cage to your pet's needs. The Critter Nation has multiple attaching points for adding hammocks, tubes, toys and other accessories that are sold separately. Constructed from sturdy square tube frame and durable wire metal, the Critter Nation cage has an attractive gray-quartz hammer tone finish that is sure to blend with any decor. If you wish to add onto or expand your Critter Nation cage, please take a look at the Critter Nation Add-On Unit (model 163) and be sure to check out our available Ferret Nation / small animal accessories to spruce up your Critter Nation as well! MidWest Homes for Pets stands behind the quality of our products with a 1 Year Manufacturer's Warranty. If you have any questions about our dog crates our customer service department would be glad to help you. MidWest customer service can be contacted at: 1-800-428-8560, available 8:00 AM - 5:00 PM, Monday - Friday.